The hunt for the elusive fiddlehead fern……..
For the last couple of weeks, Bill and I have been in pursuit of the revered Northwoods delicacy, the Fiddlehead Fern. Technically, it is called the ostrich fern. But when it first pops up through the ground, the frond is tightly curled in on itself resembling the head of a fiddle, thus it is referred to as a fiddlehead. Fiddleheads are a traditional dish of northern New England (especially Maine) in the United States, and of Quebec and the Maritimes in Canada. The Canadian village of Tide Head, New Brunswick, bills itself as the “Fiddlehead Capital of the World.” For the Maliseet Indian tribe, fiddleheads were considered to be medicinal as well as a foodstuff and were gathered in quantity during the relatively brief season before they unfurl. The fiddlehead or ostrich fern likes damp, moist ground and is usually found in damp ditches or along streamside. Fiddleheads grow in wetter areas and the harvesting of these yummy little morsels coincides with the Northwoods “mud season”, so just as “whites” are to tennis, the pair of sturdy, high rubber boots are to the “fiddleheader” or “beheader” might be more appropriate. Bill and I approach the task in the same way we go ruffed grouse hunting in the fall, I drive and Bill rides shotgun. I watch for potholes and sinkholes in the old logging tote roads, and Bill watches for patches of fiddleheads along the roadside and along the streams. This time of the year the water in the streams is running high and fast because of the snow melt in the deep woods and in the mountains. That can make for some pretty harrowing moments, like crossing washed out roads and bridges, driving right into the stream bed. For that we depend on our little workhorse Jeep Wrangler. The old Jeep will get in and out of places that would make city dwellers faint of heart. 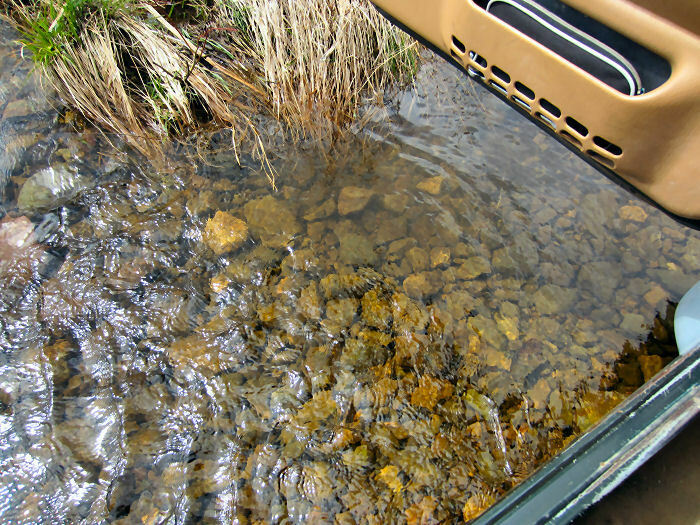 This may look a little intimidating but its a piece of cake in our tusty Jeep Wrangler. 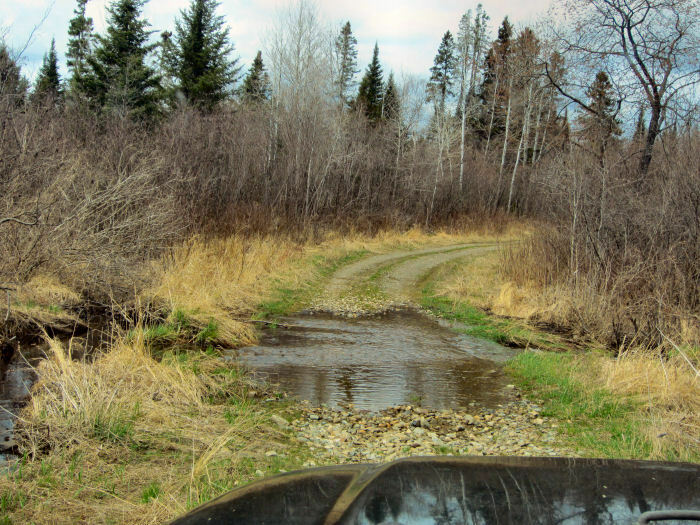 The view from the open Jeep door as I drive through the stream that has washed out the road. Because the ostrich fern likes wet, damp ground and shady areas, the best place to find fiddleheads is close to brooks and streams. 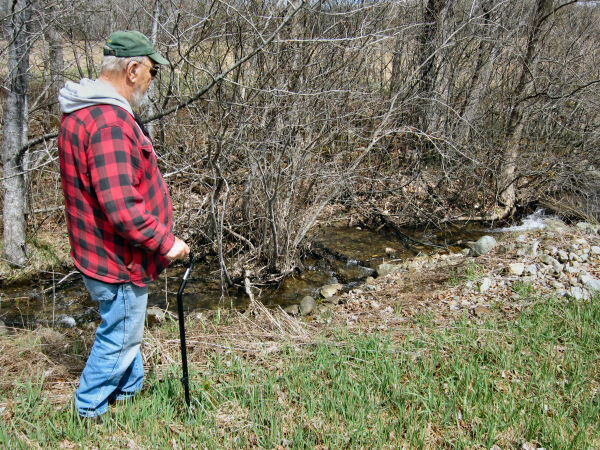 Here Bill is checking a stream that runs through a neighbors pasture. This spot has been an excellent fiddlehead spot for us for years. Bill in the hunt for fiddleheads along a little stream that runs through a pasture. 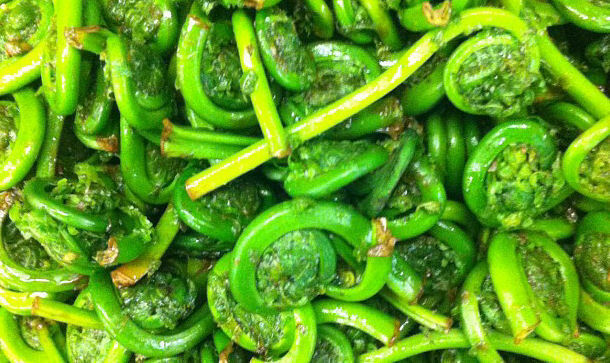 Eating fiddleheads is a Maine tradition. When spring comes it is time to try out our favorite fiddlehead recipes. Use care in harvesting the fiddlehead fern ……. True connoisseurs protect their favorite fiddlehead fern harvest areas the way a fly fisherman protects his favorite fishing spots. Be careful to pick the fiddlehead fern in a pure, pristine area and not near any kind of potential pollution such as a highway where chemical runoff from winter snow removal could invade the area in spring runoff waters. 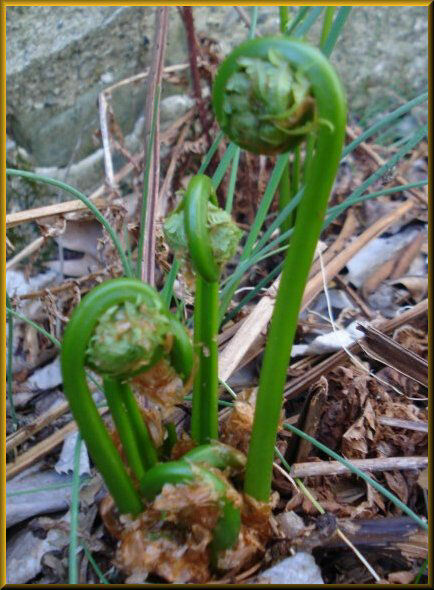 Once you find your fiddleheads, harvesting must be done carefully and with some thought if you want your fiddlehead fern patch to be productive year after year. Never take all the fiddleheads from a single plant. The ostrich fern plant will have 7 tops which will eventually turn into fronds. ONLY harvest 3 tops from each plant, leaving 4 to insure that the plant will be able to continue grow and reproduce more plants. Over-harvesting from a single plant will kill it! Proper harvesting technique is important. Harvest only the very young tops that have not begun to unfurl. 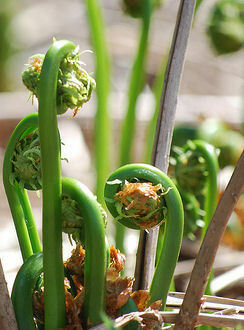 You should snap off the tops of the fiddleheads within an inch or two of the ground. It is best to pick the fiddleheads close to the ground, even partially buried. This is not a clean job! You will be crouching in wet, mucky ground so getting dirty is part of the process. 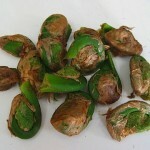 You are looking for tightly curled heads that are bright green and plump. 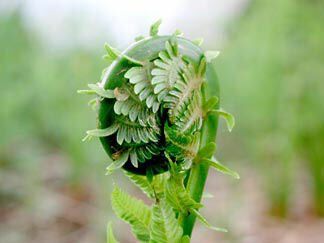 This picture shows a fiddlehead that is begun to open and too “old” to pick. Fern heads like this that have started to open will be very bitter. The freshly picked coin-shaped heads are covered in a rusty brown, papery skin. If you have to purchase your fiddleheads in a store, be sure to look them over carefully. It is normal to see the cut tips of the stem browning but dark stem centers are a sign of age which you do not want. These fiddleheads are just harvested today and ready to cook but will need trimming and cleaning first. Try your favorite fiddlehead recipe and taste this delightful Northwoods delicacy. These fiddlehead “coins” need to be washed under running water. Rubbing gently will remove the brown papery skin that cover fiddlehead ferns. The brown skin covering is not very tasty so it needs to be gotten rid off. Fiddleheads should not be eaten raw. They must be cooked. Several years back, there was a problem with a batch of fiddleheads and so the government advises cooking them in boiling water for 15 minutes. Salt the water heavily. Cook them for 10 minutes and then change the water to remove any potential toxins and boil them for 5 minutes more in fresh salted water. Another old Maine tradition is to cook them with salt pork. To do this, initially cook them in salted water for ten minutes in boiling water. Drain them in a colander. Rinse the cooking pot thoroughly to remove any toxins and add salt pork cut into ½”cubes and chopped raw onion. Sautee the salt pork until it just begins to brown and crisp and the onions are translucent, then add the fiddleheads back in with enough water to cover and two inches more. Then simmer for at least ½ hour. Keep an eye on the pot in case you have to add more water. Serve with butter. 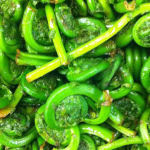 Simple and yummy….the traditional Maine style of preparing fiddleheads. 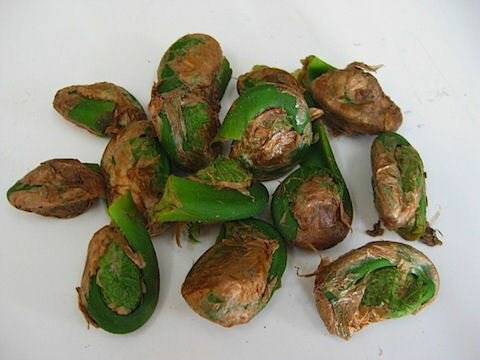 Fiddleheads can also be steamed. Bring a small amount of water to a boil preferably in steam apparatus. Add washed clean fiddleheads and steam for 10-12 minutes. Serve at once with melted butter or vinegar, or lemon juice, or a combination of any of the 3. The sooner they are eaten, the more delicate their flavor. They may be served, like asparagus, on toast. Cooked, chilled steamed fiddleheads can be also served as a salad with an onion and vinegar dressing. Most recipes that work for asparagus will also work for fiddleheads. They are similar in flavor. For health reasons Sautéing, stir-frying or microwaving ostrich fern fiddleheads are NOT recommended methods for cooking fiddleheads. Fiddleheads should be boiled or steamed prior to sautéing or stir-frying. The CDC recommends this as a result of a problem with some people getting sick from eating improperly prepared fiddleheads back in the 1990’s. Don’t let this frighten you! Bill and I have been eating them for 30 years and have never had a problem….just prepare them properly!!!! Serving alternatives – Once thoroughly cooked, they can be served in a variety of ways. Any way that you serve asparagus or broccoli will also compliment fiddleheads. Tomorrow I will post more fiddlehead recipes, so come back for “Fiddleheads Two – The Sequel”. I’ve never looked for fiddleheads, but I sure love to eat them. What an amazing journey! I’ve had the pleasure of eating them only once or twice, but had no idea of the work that goes into procuring them. Reminds me of truffles. I’m so happy that you’ve joined the premier of “Oh, the PLACES I’ve been!” and hope that you will become a regular contributor. Brings back great memories of hunting fiddleheads when I lived in Vermont! This is so interesting. I’ve never heard of these being a delicacy. I might have to go out to the yard here in the Pacific Northwest because I think I might have some fiddleheads out there. They might not be the right variety but it will be fun to check my wild ferns that are popping up! Check with your local county extension service and they should have information on their availability. Enjoy a new treat of spring! How interesting. I remember seeing these when I grew up (in Ma and Me), but never knew what they were. Thanks for taking me on your adventure!